With the Scottish referendum campaign about independence from the rest of the UK in full swing, UK Prime Minister David Cameron has been foolish to try to make North Sea oil a reason for the Scots to stay. There are plenty of good reasons to keep the UK united, but oil is not one of them, except perhaps that Scotland is going to be far too dependent on it, if it leaves. Energy journalist Chris Cragg explains the real issues the UK oil and gas sector is up against and why these will not be affected by the outcome of the Scottish referendum in September. Amidst accusations that the British Cabinet had not met in Scotland since 1921, when in fact it last met there 5 years ago, Prime Minister David Cameron last week summoned his ministers to Aberdeen. The purpose was to launch a new report by Sir Ian Wood on how to revive the flagging oil production from the North Sea. Had he been better advised, Cameron would have done well to avoid this particular strategy. If the First Minister of Scotland, Alex Salmond, knows about anything, he knows about North Sea oil. It is like putting a man on the nursery slopes up against an Olympic downhill skier. Salmond, after all, was chief oil economist at the Royal Bank of Scotland when Cameron was still at Oxford University. The First Minister has been marinated in oil for decades. Indeed, North Sea hydrocarbon policy was probably the primary reason why he launched himself on his campaign for Scotland’s independence at a time when it was hardly popular. He was advocating a Norwegian style oil revenue-based Sovereign Wealth Fund back in the 1980s, when your correspondent first met him. He has “Scotland’s Oil” on the brain. To give Cameron’s strategy its due, he might have ignored the review by Sir Ian Wood, which his own government requested. After all, UK North Sea oil and gas production hit a peak of 4.5 million barrels of oil equivalent a day (mboed) in 1999 and has been declining ever since. It is now on course for around a million boed. Consequently, a neatly dishonest strategy to keep Scotland in the UK would have been to point out the North Sea’s relentless decline and its potential impact on an independent Scotland’s economy. Scotland, after all has, with a very large public sector, three basic pillars to its economy; oil and gas, finance and tourism. Of these, tourism would certainly remain stable on independence, but the finance sector is probably too large for a nation of 5.3 million people and thus vulnerable to “bank emigration”. If it could be stated that the UK’s North Sea revenue was sinking fast and would continue to do so, the Scots might be persuaded that staying in the Union might be a safer policy. So substitute “the Scottish economy” for the “UK economy” and there it is! For the sake of simplicity leave out the UK’s southern gas fields and divide this sum by the population of Scotland and it works out at around £377,000 per capita, or about £19,000 a year. You can buy a lot of free health care, education, unemployment benefit and whisky with that kind of money. You cannot quite get to the heights of the Norwegian Sovereign Wealth Fund, which now stands at $982 billion, but you might make a start. You will however have to bear in mind that according to one of the fundamental rules of finance, you cannot spend it and save it at the same time. So how does MERUK propose to revitalise the UK sector of the North Sea? Broadly there are four recommendations. First and foremost, both government and industry should develop and commit to a new strategy to maximise economic recovery from the UKCS, or MERUK as it is now to be called. Second, there is a need to “Create a new arm’s length regulatory body charged with effective stewardship and regulation of UKCS hydrocarbon recovery, and maximizing collaboration in exploration, development and production across the Industry”. Third, this new regulator should take additional powers to facilitate the implementation of MERUK and fourth, it should develop and implement various sector strategies including sharing of data on exploration, asset stewardship to improve production and recovery, concentrate on regional development starting in the southern North Sea, improve infrastructure and develop enhanced recovery and carbon capture technologies and pay some attention to decommissioning. It is hardly surprising that Oil and Gas UK, the UK’s oil and gas industry’s lobbying group welcomed these recommendations and described them as “a game changer”. They might have written them themselves. After all, the first recommendation, that the government take seriously maximizing the economic return from the UK North Sea, is precisely what the lobbying group has been demanding for years! For Salmond is almost certainly right to point out that the decline in North Sea output has at least been partly the result of the UK government’s own tax policy. For example, back in the March Budget of 2011, George Osborne, the Chancellor of the Exchequer, abruptly announced without any serious consultation that in addition to Corporation Tax, the supplementary charge on oil company revenues would be increased from 12% to 32%. Worse, while corporation tax on other activities would be lowered from 28% to 23% over time, for the oil and gas industry the contribution would stay at 30%. The net result was that taxation was skewed against the older fields at 81% for historical reasons, precisely on those fields that were most expensive to keep going. As a last insult, the budget de-linked decommissioning costs from the new tax rates and suggested that a cap would shortly be put on such costs for any kind of relief. It was completely in vain that the boys and girls at Oil and Gas UK jumped up and down in dismay, not least because they had been expecting something rather nicer. As they pointed out at the time, there were plans for some 60 new North Sea projects on the stocks, including 35 new fields and $22 billion-worth of investment. As a direct result of the tax changes, 25 projects had less than a 50:50 chance of going ahead, losing roughly £12 billion in new investment. It is largely these projects that Wood suggests should now go ahead, Osborne having finally shifted tax policy back onto a more sensible course. It is thus a significant cause for rejoicing to the lobby group that Wood recommends that North Sea oil policy should be decided by a “cohesive tripartite course” between the industry, the new regulator and the UK Treasury. This should at least give the industry a chance to educate the Treasury about a fact of economic life, namely that if the oil industry says it will walk away from new projects, it probably will. There is also another source of joy for the industry in the report. This is the new “independent regulator”. This, at minimum, should mean that oil and gas regulation gets a new emphasis rather than being stuck somewhere deep in the mysterious bowels of the Department of Energy and Climate Change (DECC). For unlike its long abolished predecessor, the Department of Energy, DECC has a contradictory set of targets, one of which is to maximize UK hydrocarbon production, while simultaneously minimizing climate change. With the current problems of electricity power plant renewal, not to mention dealing at arm’s length with the complexities of the domestic gas and electricity markets, it is hardly a surprise that the North Sea is not its leading priority with only 50 people involved directly in oil regulation and encouragement. The new regulator thus gives a chance for a serious re-examination of strategy in much more detail than currently available from government. It could look at why, if licensing rounds are so successful, so few lines of seismic are run. They could look at why more infrastructure tie-ins on pipelines are not made, why efficiency is in rapid decline and whether competition law is a problem. Not least, the new regulator will add more force to the detailed activities of the industry/government groups in co-operation in such operations as PILOT, whose recommendations are often ignored. There is, in short, much to be done. That said about the new inspectorate, there are some questions to be asked about it too. Firstly Wood suggests that the new regulator should be paid for by the industry, thus breaking one of the first rules of normal regulation, which is that “arm’s-length” should not normally mean that the arm is handing out the cash. The second problem may well be that the regulator becomes a collection of oil executives on secondment from companies, but still bearing allegiance to their old colleagues and likely to return to them. As Wood put it: “The new Regulator’s role will be licensing, supervision and stewardship. It must be low in bureaucracy, high in skills and experience, and strong and pragmatic. It must be the catalyst for maximising the economic recovery by facilitating, co-ordinating, mediating and promoting collaboration, removing barriers, and encouraging more efficient exploration, development and production.” The CEO will have to be tough too. In the absence of the Archangel Gabriel and his cohorts, salaries are likely to have to be rather higher than those for the people now doing the job in DECC. So does this help Cameron and his desire for a vote against Scottish independence? Not much. There is no reason why Salmond shouldn’t set up a new regulator of his own in Aberdeen. Equally, while there has been much comment about how to agree on a line separating the rest of the UK waters from Scotland’s, this is largely irrelevant, for however you divide it, Scotland gets about 95% of the oil production and 58% of the gas. Consequently, of the £11.25 billion that went to the UK Treasury in 2011-2012, £10.57 billion or 90% would go to direct to Scotland on a geographical rather than a UK per capita split. The trouble for Scotland about this number however is that it reflects not only high international prices, but the effect of Osborne’s 2011 tax raid on the oil companies. Consequently, while undoubtedly Salmond is on safe ground in arguing that North Sea oil is “Scotland’s oil” and Cameron can’t really use the Wood report as an argument for the Union, Salmond cannot squeeze the North Sea for more revenue than it currently produces without slowing it down. Or seeing it decline. Salmond also knows, being an expert, that the US shale oil boom could move against future revenues by lowering Brent prices. For without the new regulator and his quasi-magical powers, the outlook really isn’t very good. For shortly after Wood reported, Oil and Gas UK published its annual Activity Survey for 2014. This described the situation as “contradictions currently at play in the UK offshore oil and gas sector”, by which it meant that investment spending was pretty high, production was falling very marginally less fast than last year, but that exploration was dire. The situation is as follows: Investment was a record £14.5 billion in 2013 and is likely to remain above £10 billion in the future. Production was 8% lower than in 2012, but not as bad as the average yearly decline of 15% during 2010 and 2011 and expected to increase to 1.7 million boepd by 2018, when 40% of production is expected to come from new fields. However only 15 exploration wells were drilled in 2013, compared with 44 in 2008, which added a mere 80 million barrels to proven reserves, or to use a technical term a mere spit in the ocean. Appraisal wells were better at 29 but a lot were cancelled or postponed due to rig shortages and problems in accessing finance. So record investment has produced just four large fields, but fewer barrels under production, under development or considered for investment. This contradiction can at least be partly explained by rising costs, which hit £8.9 billion in 2013, and is the highest on record in real terms. Average unit operating costs (UOCs) have now hit £17 per boe and the number of fields where it is over £30 have doubled in the past 12 months. This to quote the Activity Survey is “unsustainable”. At least part of the problem with rising costs is where the new larger fields are to be found. One of the biggest new projects, BP’s Clair Ridge field is 75 km west of Shetland in 140 metres of water. 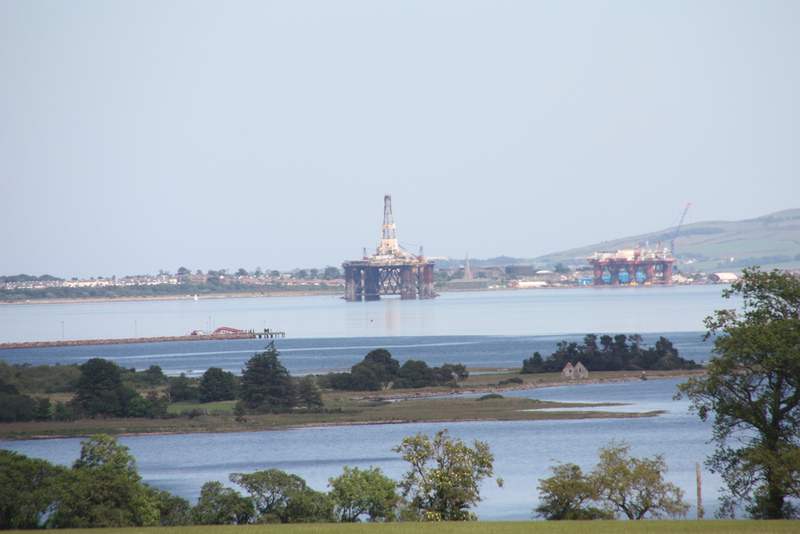 It is a £4.5 billion investment for 640 million barrels and an output of 120,000 bd at peak, which should replace and increase the 60,000 bd now in decline from the original Clair field. However, to maximise the production of the heavy oil found in the Clair structure, water uplift will be needed using BP’s LoSol desalinated water. This adds a 1,000 tonne desalination plant to the twin platform structure and does not come cheap. Frankly this will not change regardless of how the Scots vote in September. The UK North Sea is going to need a lot more investment just to stand still. Meanwhile, looming on the horizon is the estimated £40.6 billion decommissioning cost, which nobody wants to talk about much. So who gets to pay that? As for a Scottish Sovereign Wealth Fund, it sadly may be too late to start, not least because of the fiscal and other uncertainties that will surround the new country if it votes to leave the Union. These of course include the issues of what currency Scotland will use and European Union membership. Either way, it seems very odd that Cameron, representing a political party that is hated in Scotland, should choose to go to Aberdeen and make some kind of issue out of oil. There are so many other issues that could be raised from the future of the British army to the future of the BBC. Both sides of the argument have problems of their own. The Scottish nationalists have emotion tempered by economic uncertainty. The unionists can offer economic stability, but can’t assert that Scotland might become more economically uncertain, without being accused of arrogant bullying. The nationalists wish to suggest that nothing will really change, while the unionists can’t emphasise that it undoubtedly will, for fear that it might. The time they will assert themselves to protect their own interests will be after the Scots vote ‘yes’, if they do. There will be an awful lot of negotiation then, but it is doubtful if the North Sea will be a significant part of it.